UPDATED: Sat., Feb. 2, 2019, 6:53 p.m.
Kim Aiken Jr. was better. Eastern Washington’s freshman forward scored the bulk of his team-high 24 points in the second half Saturday in a 82-79 win over Southern Utah at Reese Court. Aiken also ripped down 11 rebounds, had four blocks and the game-sealing steal for EWU (7-13, 5-4 Big Sky), which has won four of its last five contests. EWU trailed most of the game but came up with key stops down the stretch, limiting Better, Southern Utah’s high-scoring guard. Better scored a game-high 35 points but was held to a one field goal in a 10 minute second-half stretch when the Eagles gained a lead they didn’t relinquish. Aiken connected on six of his first seven second-half shots, scoring from the both the outside (4 for 5 from 3-point range) and in the paint. Davison was also big late, scoring 13 of his 21 points in the second half, including back-to-back buckets in the final 2 minutes to help put Southern Utah (9-10, 4-6) away. A pair of Aiken 3s and a layup by Jesse Hunt (16 points) sparked a 15-2 run for EWU, which led 79-70 with 32 seconds left. 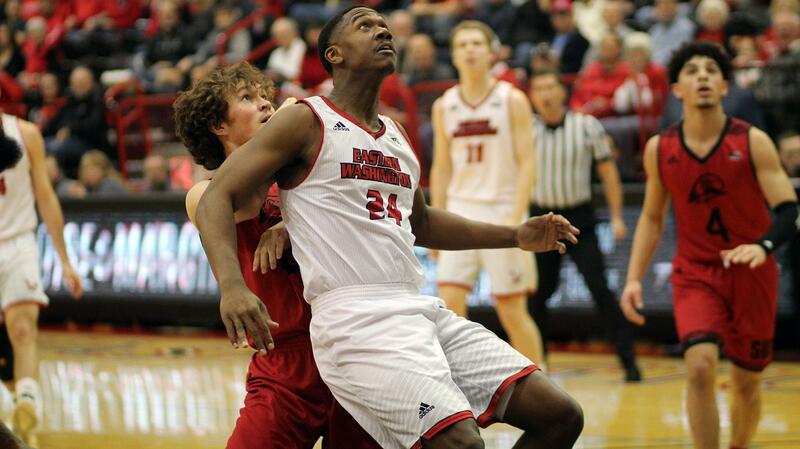 “(Aiken) followed the game plan and was unbelievable,” EWU coach Shantay Legans said. “He kept going and playing – shooting and rebounding. He did everything he possibly could. EWU was without the services of its primary inside threat, Mason Peatling, who sat because of a recent ankle sprain. His status for Monday’s home game against Northern Arizona will be a game-time decision, according to Legans. The Eagles couldn’t establish much rhythm early, trailing 31-19 when Better hit a 3-pointer late in first half. EWU answered with a 18-6 run, capped off by a jumper by Tyler Kidd (15 points) at the halftime buzzer to tie the game at 37. Both teams hit 11 3-pointers and the smaller Eagles won the rebounding edge 35-32. Published: Feb. 2, 2019, 6:51 p.m. Updated: Feb. 2, 2019, 6:53 p.m.